Hey, guess what? It’s the second week of the Petey Post! They let me come back and do this thing again. I know, I’m just as surprised as you are. After contrasting Nebraska with an old rival last week, this week I thought I’d stick to a similar theme. So, congrats, today is all about the Iowa Hawkeyes. Just kidding. Please keep reading. We’re talking running backs this week. I’m going to break down what each of the four backs in Nebraska’s stable brings to the table, and look at the argument for each becoming the featured runner. Let’s get started. Of the four, Ozigbo feels, to me, like the most natural option in Nebraska’s backfield. At 6-feet, 230 pounds, the Sachse, Texas, native has the physical frame to be an every-down back at this level. He’s been a two-year backup to this point in his Husker career but he’s shown flashes of something special. Last season, Ozigbo popped Fresno State for 103 yards and two scores on 17 carries in the Huskers’ opener. Two weeks later, he had 95 (important) yards against Oregon with another score. The powerful I-back possesses the ability to turn up field in a hurry. His tape showcases a decisive runner that won’t dance around or try to get too cute behind the line of scrimmage. I see a one-cut type player that finds his hole, hits it hard and welcomes contact. That’s the kind of running back that does better in a featured role, when he can get into the groove of the game and wear on opponents. In two seasons, he’s carried the ball 15 times or more in a game four times. In those four outings, he’s averaged just under five yards a carry. Throw in a seven-carry, 70-yard performance against Illinois his freshman season and a seven-carry, 66-yard showing against Tennessee last season and the intrigue is there. His numbers would have been even more impressive last season if not for a nagging injury in the back half of the year. He can catch it out of the backfield (a must in this new-look Nebraska offense) and can turn on the jets in a hurry. He’s also got the upper body strength to break tackles and keeps his legs churning even with defenders hanging on him. 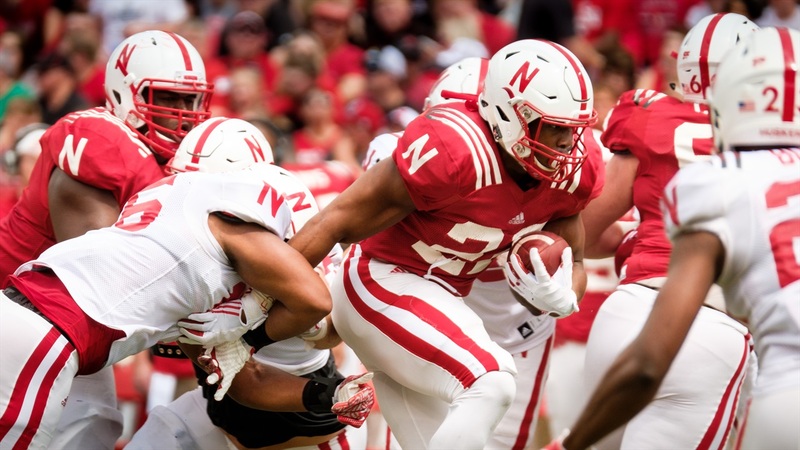 Ozigbo would be my choice, if I had Mike Riley’s job, but I don’t (much to the joy of pretty much everyone everywhere) and unfortunately for the junior, he appears to be looking up at our next guy. Tre Bryant, a sophomore from Christian Brothers College in St. Louis, Missouri, is the trending name in the Huskers’ backfield this offseason. All throughout summer and into fall camp, Bryant has pushed for the starting job and he’s received a large number of first team reps. Fellow Hail Varsity stud Greg Smith sees him as the “most complete” back of the group and his former high school coaches aren’t surprised to see him pushing for such a large role so soon. Bryant too has decent hands out of the backfield, and has shown the ability to both run between the tackles and bounce things outside. His do-it-all ability figures to afford him every opportunity to take the job and run with it (haha) once the season actually starts on Sep. 2. In 2016, his true freshman campaign, Bryant racked up 173 yards on 43 carries. For you math whiz kids at home, that’s exactly four yards per carry. For the less numerically inclined folks like myself, that means, theoretically, Bryant can be relied on to keep the offense ahead of the chains and on schedule (another big thing for the offense). Granted, 43 carries over the course of an entire season is a small sample size, but Bryant pairs upside with a “been there, done that” mentality that can’t really be matched by any other guys in the Nebraska backfield. If the coaching staff feels like it knows what its going to get from Ozigbo and prefers to use him in a change-of-pace manner, Bryant would be the guy to turn loose. You’ll probably wind up seeing Bryant run over more people. And run away from more people. There are a few questions with the 5-foot-11 back, though. A knee injury has cost him some practice time and set him back a bit, and there’s always the ball-security and pass-protection issues that flare up in young guys. But, if Bryant can, say, show out against Arkansas State, the job might be his to lose moving forward. If Ozigbo is my guy, and Bryant is the presumed front-runner, Wilbon has all the intrigue. The junior from Chicago, Illinois, is like a bowling ball. But in a good way. Wilbon is listed at 5-foot-9 (which is either generous on the part of Nebraska’s staff or I’ve grown since my last physical and my doctor was wrong) and is a whole two inches shorter than Bryant, yet they’re listed at the same weight. The difference? Lean muscle, and lots of it. Wilbon’s upper body is impressively built and he looks to have the leg strength to fight for those extra 2 or 3 yards on any given play. Also, Wilbon probably has the fastest feet of the bunch and has a good bit of potential as a receiver in the screen game. He just doesn’t have a ton of experience and is, yet again, trying to separate himself from a pack. For his part, Wilbon has tried to work on his route running, coverage reading and pass protecting this summer – all things that should be music to offensive coordinator Danny Langsdorf’s ears. If Wilbon can translate a fall camp in which he’s gotten legitimate run with the first unit into consistent playing time in 2017, it’ll probably be due in large part to his versatility as a runner and pass-catcher out of the backfield. Last season, he had 89 yards on 15 carries, with a career-long 32-yard scamper against Northwestern, as well as 34 yards receiving. Wilbon has seen such little run in Lincoln, he doesn’t even have a highlights package on YouTube. Fear not though, there are a few nuggets to be found in his high school tape. Like this nifty move where he makes a pair of kids whiff real hard on a tackle. Spoiler alert: Wilbon scored that touchdown. It's likely Wilbon will get some run in Nebraska’s season opener against the Red Wolves, if anything because the coaching staff still hasn’t decided on a starter and I see that first game as more an extension of camp and preparation for Oregon on Sep. 9. It’s also just good to reward hard work, and Wilbon has put in a ton of that over the summer. We have reached the wild card. The 6-feet, 180-pound, Bellevue West product has gotten some solid reviews from coaches during fall camp. The top-rated skill player in the state of Nebraska for 2016 doesn’t look like a freshman, not according to the coaching staff. And they’re more than pleased with his work so far. And if Bradley is going to see the field often this season, excelling in the nitty-gritty areas are going to be a must. Davis said the freshman has done a “very good job” in pass protection situations and isn’t afraid to stick his nose into the action and mix it up with a few linebackers. “When he has the ball in his hands, he’s explosive and fun to see," Langsdorf said back when camp first opened. Bradley possesses that unique blend of power and speed that makes him an interesting look in the offense. Still, his role this season – should he avoid a redshirt and everyone above him stays healthy – would probably be confined to special teams with some touches trickling down from there. But, if Nebraska views him as the future at tailback, and this season truly as a transition year, it wouldn’t be surprising to see Bradley’s workload ramp up as the season progresses.